Fair Isle or stranded knitting is a fun and relatively easy way to add color to your projects by working with two different colors of yarn repeatedly in the same row, keeping both strands connected to the work at all times. Once you grasp the basics of how to knit stranded knitting, it's pretty easy to complete the technique successfully, but here are some tips that might help you along the way. The biggest problem most people new to stranded knitting have is pulling the yarns too tightly when changing between yarns. The floats across the back of the work need to be flexible enough to allow the front of the work to lie flat. If you have puckering in your work or it looks like an accordion-folded piece of paper, you're pulling too tightly. Rip back and try again. On the other hand, the floats shouldn't be so loose that you're likely to snag body parts on them when you try to wear the garment you're knitting (it's also just a waste of yarn). Try to ensure that the previously worked stitches are stretched out nicely on the needle before you work the first stitch in the next color. That should give you enough, but not too much, flexibility in the float. Another big potential problem or source of confusion for new Fair Isle knitters is how to deal with the two different colors of yarn. Is there a right way to switch between the two? 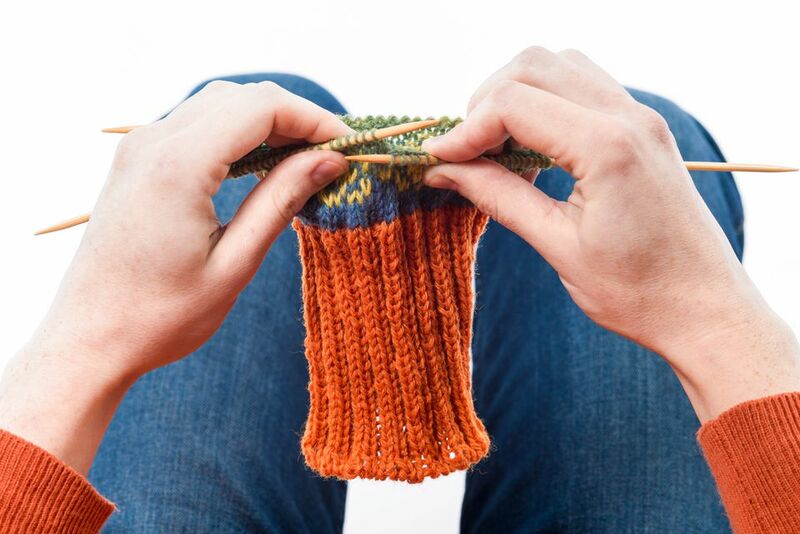 Some sources say that you should always pick up the new yarn from underneath the yarn you were just working with to ensure that no holes form in the knit fabric. That's a fine practice, but it turns your working yarns into a mess as they twist and twist around each other. A less crazymaking approach is to choose one color to always pick up from the top and one to always pick up from the bottom. It is basically what you're doing when you knit both English and Continental at the same time, holding one strand of yarn in each hand. As long as you consistently work one color with one hand and the other with your other, this will keep your work from having holes and prevent your yarn from twisting. It's also just a lot faster because you don't have to pick up one yarn, knit the stitches, drop that yarn, then pick up the next, knit with it and so on. Remember, too, since most stranded knitting is worked in the round, that at the points where you switch between needles the yarns are going to want to take a sharper corner, making the float tighter than it would otherwise be. You may want to pay extra attention to the first stitches in each color on each new needle to ensure that the strands across the back look the same as the other strands.